The S&P 500 is down around 4% from its highs (outperforming the high-beta hangovers of Nasdaq and Russell 2000 that were down almost 10% from their highs at today's lows). 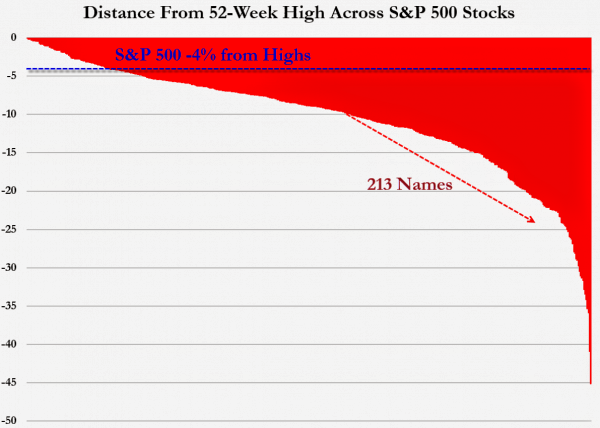 But under the surface, the S&P is ugly with the 500 index members down 10.5% on average. 213 members of the S&P 500 are down over 10% (in correction mode). Only 72 member of the 500-stock index are 'beating' the index... this is not just a small-cap growth-hype selloff... it's spreading..